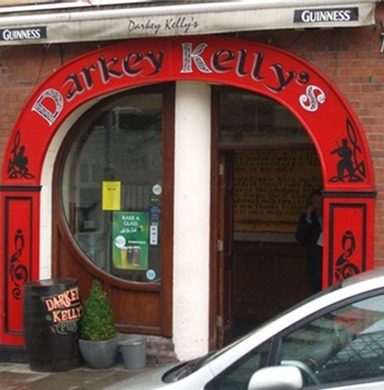 Darkey Kelly’s isn’t the easiest place to find as it is located on Fishamble Street, just between the quays and Lord Edward Street, but after a brisk 20-minute walk we darkened Darkey’s door and we were all expecting a good time. The red horseshoe-shaped nameplate is an unusual and attractive feature. The Old Commando led the charge as the troops made their way to the bar, where a foreign barman, possibly of Middle Eastern descent, was on hand to serve us. There was a vast amount of options available – with pitchers of Bulmers at €12, pitchers of Tennent’s at €10, and pints of Howling Gale, Barefoot Bohemian or Sunburnt Irish Red all available for €3.50. In fact, we counted over 20 taps in total, while there was also an array of bottles available, including two bottles of Budvar for €5. Never one for the exotic tastes, the Old Commando ordered a round of Guinness for each of the troops, setting him back €4.70 a pop. “Jasus, that’s not cheap, but I thought it would be a lot worse up here in the heart of the rip-off Republic,” our Rural Commando joked. We never count €4.70 as ‘cheap’, but we definitely have been stung for more in the past. 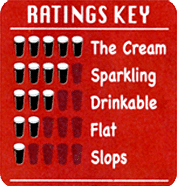 As much as we moan about the price of stout, there’s no doubt the taste can ease the pain and here in Darkey’s, it certainly did. The old boy was very satisfied and before we knew it, he had ordered his second. We didn’t get much talk from the barman, although the Young Commando rightly pointed out that he probably isn’t big into the GAA. UNUSUAL: A horseshoe-shaped nameplate welcomes you into this fine boozer. It wasn’t overly busy during our stay, but there was a nice blend among the mixed clientele that was present. The majority of customers were tourists and Darkey’s didn’t really strike us as somewhere that somebody would call their ‘local’. counter and they were quite comfy. The timber floor was clean, as was all the furniture, and there were three TVs in total. There is a nice tribute written on the interior wall on the far side of the bar about the legendary late Luke Kelly, while one of the Commandos noticed a list of different Irish whiskeys available in this boozer. He counted 50 in total. Think of the hangover! There are also some lovely photos of Ireland’s historic victory over England in Croke Park back in 2007 and the Young Commando stressed his disappointment that Ireland couldn’t do the same at Twickenham recently. The one photo that stood out head and shoulders above the rest was an action shot of Mayo’s Willie Joe Padden out-jumping Dublin legend Brian Mullins – arguably two of the greatest midfielders to ever grace Croke Park – in the drawn game of the 1985 All-Ireland semi final. ‘He may have out-jumped him that day, but Mullins won the war the next day,’ the Old Commando told us. ‘Yeah, but Kerry won the war that counted and Willie Joe collected an All-Star,’ our Young Commando jeered, as he got the last laugh. The toilets were clean, but one of the cubicles was missing a lid. There are two sinks, two urinals and a checked hourly sheet on the loo door. There is also a beer garden in this pub, but it closes at half ten, which we found unusual. Darkey’s is a fine establishment and caters well for the tourist trade. We enjoyed our pint in the pleasant surroundings and plan to return in the future.